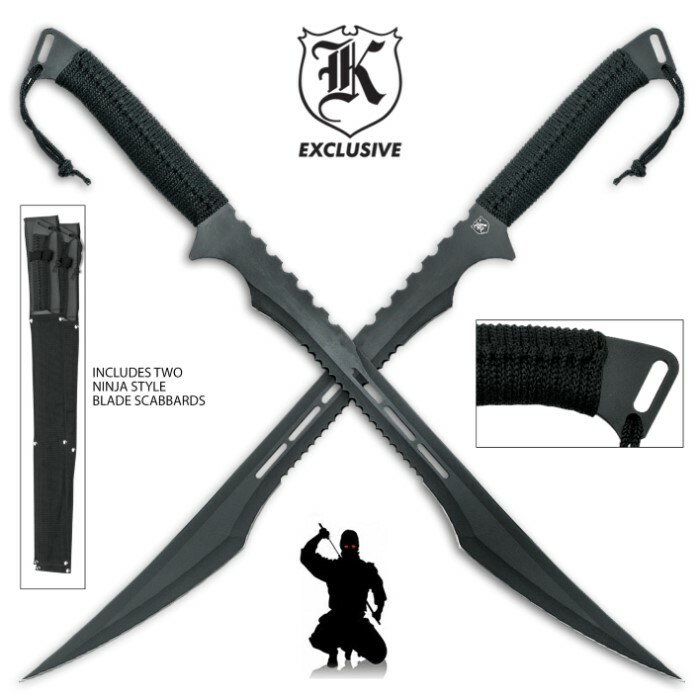 You can fight like a ninja in your own right with this two-piece twin ninja tactical sword duo. Each one of these bad boys features rock-solid full-tang stainless steel construction with a heat-treated black finish for a covert appearance. The fantasy-style blades feature decorative cut-out designs and sharp serrations, making these blades stylish but fully functional. The handles are generously wrapped in black cord for a serious ninja grip. Finally, these tactical twins each come in their own individual over-the-shoulder nylon scabbards that you can wear in true ninja fashion. Each one measures 27" in overall length. 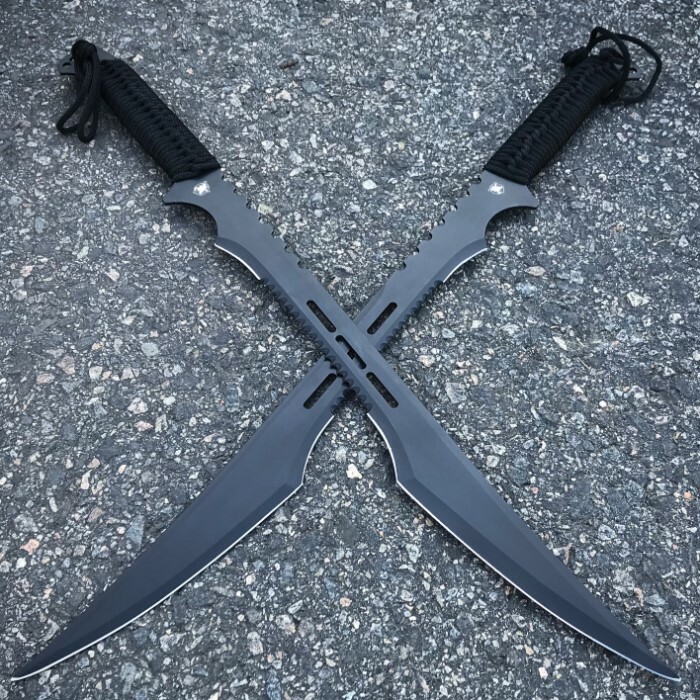 These swords are also used by the character Deathstroke on the TV series Arrow. I wish more of these dual swords came in there own scabbards like this did. Great slicing design for these sorts of cutout swords. If they did away with the serrations itd be perfect to me. But that slicing tip is peak cutting for this pricepoint. My girlfriend got me these for my birthday, great swords, only problem is that not only did they only send one sheath, that sheath wasn't even stitched together properly and was already tearing at the seams, only let down I got. Excellent pair of swords. Very sharp edges! Well made, with hand tied para-cord grip. Great value for the price, I repeat, GREAT value. Scabbards were so-so but I won't be wearing these on my back. They however will make an awesome display crossed on the wall. The tip can be considered blunt, but will suffice for most needs. The blade itself is sharp and durable however, the sheath is terrible and the handle is cheap. It's handle is made up of wrapped nylon around 2 slabs of wood. I do recommend this product however. Creating a new handle yourself isn't too difficult and people can find their own way to acquire a decent sheathe whereas the blade itself is 100% worth it. The carbon coating was scratched and the tips are blunt. Also the threading on the handle is loose. For this price I had no high expectations with the sharpness of the blade but the scratches and the blunt tip makes the sword look used and old. The quality of these swords were definitely a surprise. When buying two swords for $20 you don't expect too much. However, these swords did in fact serve as a surprise. The blade itself was decently sharp, and the serrations running along the blade were sharp enough to easily injure someone. The scabbards for each are really not the best, and the stitching on the sides of the scabbards don't hold up very well. All in all, the sword itself was a well spent purchase. I just got mine today, I did not expect much from the sheath. But the swords themselves came dull (unsharpened) and with broken tips as if unsharpened or handled improperly. The tip of one of the swords also is bent in which demonstrates even more mishandling. There also was some kind of lubricant coating and scratches on one of them which made the black coating to come off a little. I know budk to deliver on their promise of quality , and as a first timer buyer I expected more. Do not get me wrong, the design is very cool but the quality of what i got truly made me regret my buy. This swords are great! I use mine often for machetes but the sheaths definitely need to be more durable, on of the swords cut through the sheath and I ended up getting a nasty would on my foot. I also have to rewrap the paracord on the handles. Overall pretty nice though. Great and durable sword. It's a nice solid blade. My only problem (along with the other people on here) is the crappy sheath and grip. The paracord easily comes loose and undone and the flimsy sheath is easily cut by the blade. However, for the price, it's a solid sword that is amazingly sharp.